Welcome to our website! We are in the process of collecting online materials here - be sure to come back for more information. General information on the book can be found on the Wiley-Blackwell site. The computer has become the medium of choice through which much of our language use is channelled. Modern computer systems therefore spend a good part of their time working on human language. This is a positive development: not only does it give everyone on the Internet access to a world of information well beyond the scope of even the best research libraries of the 1960s and 1970s, but it also creates new capabilities for creation, exploitation and management of information. These include tools that support non-fiction, creative writing, blogs and diaries, citizen journalism and social interactions, web search and online booking systems, smart library catalogs, knowledge discovery, spoken language dialogues, and foreign language learning. 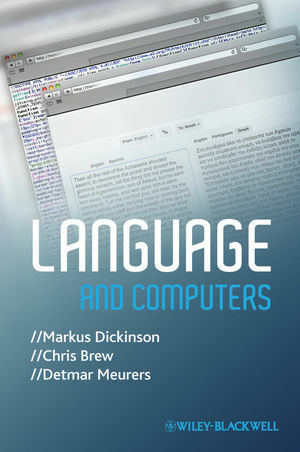 This book takes you on a tour of different real-world tasks and applications where computers deal with language. During this tour, you encounter essential concepts relating to language, representation and processing, so that by the end of the book you will have a good grasp of key concepts in the field of computational linguistics. The only background you need to read this book is some curiosity about language and some everyday experience with computers. This is indeed why the book is organized around real-world tasks and applications. We assume that most of you will be familiar with many of the applications and may wonder how they work or why they don't. What you may not realize is how similar the underlying processing is. For example, there is a lot in common between how grammar checkers and automatic speech recognition work. By seeing these concepts recur -- in this case, something called n-grams -- we hope this will reinforce the importance of applying general techniques for new applications. The book is designed to make you aware of how technology works and how language works. We focus on a few applications of language technology (LT), computational linguistics (CL) and natural language processing (NLP). LT, CL and NLP are essentially names for the same thing, seen from the perspectives of industry, linguistics and computer science, respectively. The tasks and applications were chosen because: a) they are representative of techniques used throughout the field; b) they represent a significant body of work in and of themselves; c) they connect directly to linguistic modeling; and d) they are the ones the authors know best. We hope that you will be able to use these examples as an introduction to general concepts which you can apply to learning about other applications and areas of inquiry.